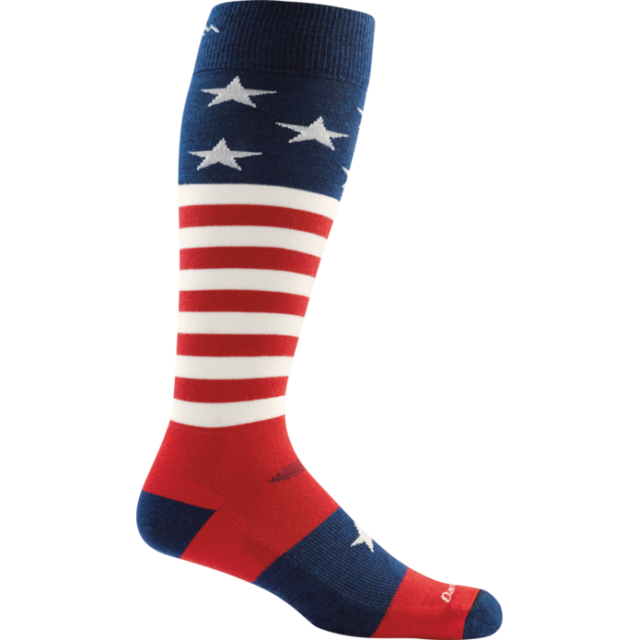 Strangely, attitudes about ski socks largely seem to fall into two camps: either you don’t care or think about socks much at all, or else, you wouldn’t dream of skiing in anything other than your personal favorites. 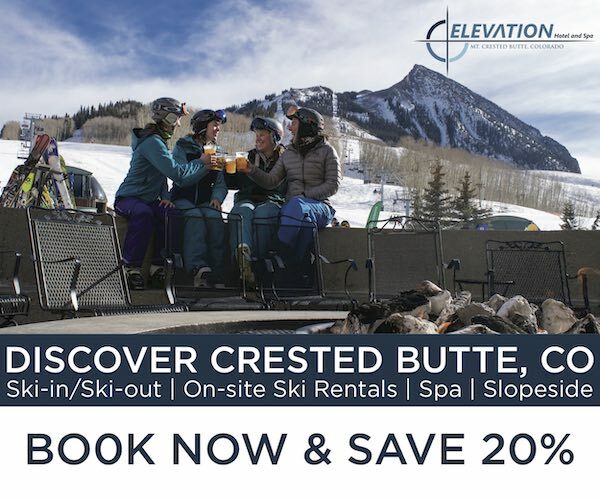 But we are here to say that socks really do matter, and the wrong pair can really screw up your backcountry tour or your day banging out chairlift laps. So whether you’ve never given much thought to them, or have been too loyal for too long to your favorite brand, it could be time to reevaluate. Furthermore, feet vary a lot, and personal preference is also a big factor. Some of us like the thinnest sock possible, while others prefer more cushioning. Some really value easy on / off, while some of us will put in a bit more effort getting the socks on in order to get a very tight, secure fit. So we’ve rounded up here 17 pairs of ski socks, and broken them out based on how much cushioning they have (non-cushioned, light cushioning, and medium cushioning). We then go into detail about what differentiates each sock from the others, making it easier to figure out which will work best for you. 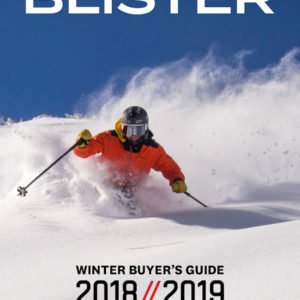 Jonathan Ellsworth: While it might seem counterintuitive, thin socks can make your feet much more comfortable (and potentially warmer) when paired with a properly fitting ski boot that’s not too big. I’ve drunk the Kool Aid that says that, when it comes to ski boots, the thinnest sock is actually the warmest sock. I typically wear pretty tight boots that don’t have a lot of extra space. Then I wear a very thin sock. Then I go ski, and I am very rarely bothered by cold feet and toes. 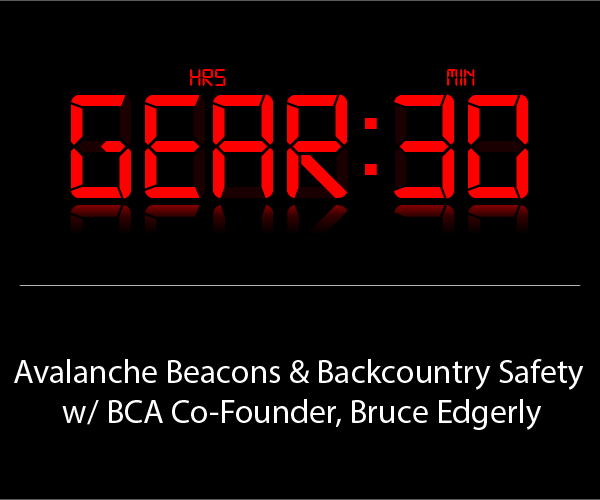 Jonathan: If your top priority is skiing in the thinnest sock out there, then this is our top pick — and it has been for years. It’s also worth noting that these socks don’t get thicker (or, at least, noticeably thicker) around the upper calf, so for those who have bigger calves or boots with low-volume cuffs (e.g., the Salomon S/Max 130), these may very well be your best option, and they are my go-to when I’m out skiing and testing boots that have the tightest shell fit. Jonathan: I own a number of very-minimally-cushioned socks from different brands (e.g., Icebreaker, SmartWool, FITS, Darn Tough, CEP Compression), and I don’t hate any of them — the most important thing for me is that the socks are thin. But on many days when it’s time to go ski, I dig through my sock drawer to see if there isn’t one pair of SmartWool PhD Ultra Lights that isn’t in the dirty laundry pile. (And to be honest, if I can’t find a clean pair, I’ll usually decide that I can get one more day of skiing out of the pair on top of that laundry pile.) Gross? Yeah, sort of; but these are wool, and they aren’t quick to get funky. Above all, I suppose it says how much I like these socks for their combination of comfort, durability, and relative thinness. The old PhD Ultra Lights used to wear out pretty quickly (a consequence of how thin they were). But Smartwool updated these socks several seasons ago, and they are now very slightly thicker. But that very slight additional thickness has translated into a very significant boost in terms of durability. I used to get holes in my Smartwool PhD Ultra Lights. I never do now with these. 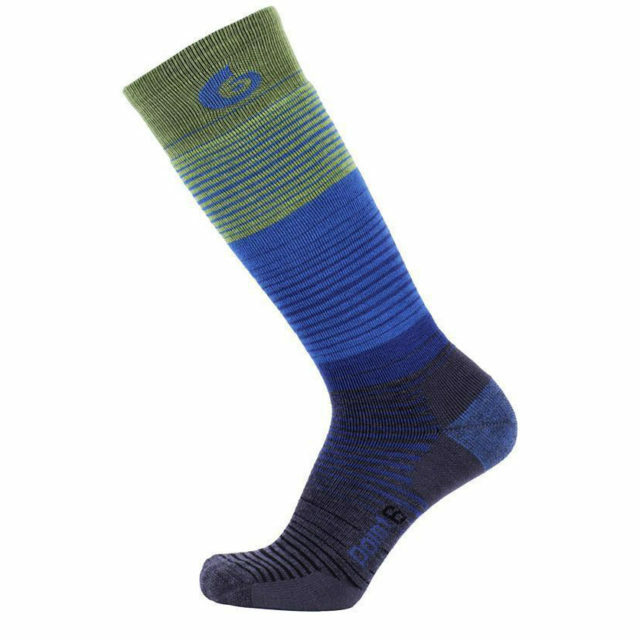 Jonathan: This sock feels very similar to the Smartwool PhD Ultra Light, with a precise fit and thin material used throughout. The main thing that distinguishes the FITS Ultra Light is its cuff height — it’s a bit higher than the PhD Ultra Light. So if you like your socks tall, here you go. 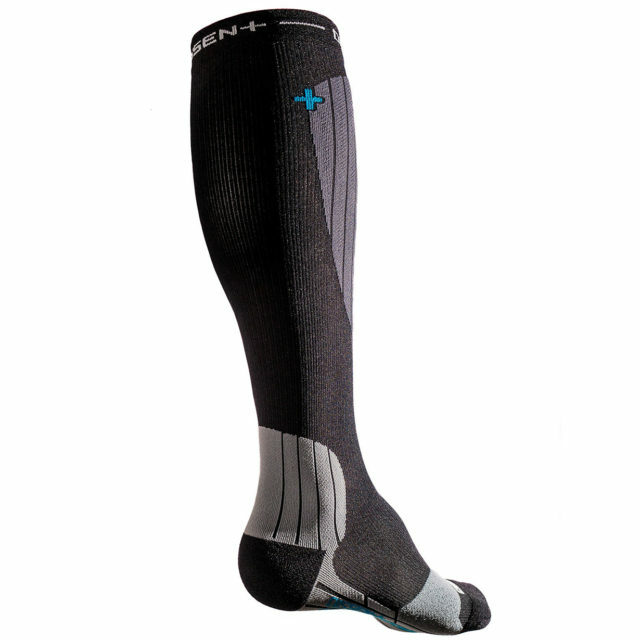 Jonathan: The Aspire Twelve is a basically a bargain of a compression sock. Like other compression socks, they take a bit more time and effort to put on. But I have come to appreciate how thin these are for a compression sock (they are perhaps just a bit thicker than the Smartwool PhDs above, and pretty similar to the FITS and Dissent socks in this section). I can also report that these socks have reduced blistering a bit when touring in new boots / new liners, so I will often break these out when reviewing a new AT boot / liner combo. 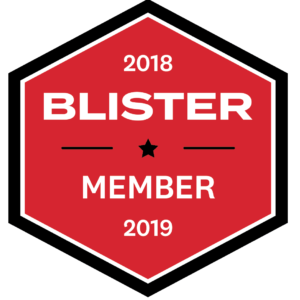 So if you have issues with getting blisters on the inside of your heels when touring, you might want to check these out. Luke Koppa: These are the most precise-fitting socks I’ve ever used. They’re also some of the most expensive. Dissent’s socks all feature graduated compression, which means they have a very tight fit around the foot and ankle, and then progressively get a bit looser as you move up up the sock toward the top of your calf (though they’re still quite tight at the top). The result is a fit that’s much more secure than non-compression socks, and I’ve also noticed that I get slightly less calf fatigue in Dissent socks vs. non-compression socks. The Nano Tour is Dissent’s thinnest ski sock, and it’s my favorite for long days on the skintrack and when I’m using boots with a tight, precise fit. They’re not quite as thin as the Bridgedale and Smartwool socks above, but the Nano Tour is far from bulky. The Nano Tour also features fibers on the foot of the sock that are very slippery, and I feel like I get less hot-spots and blisters while touring in the Nano Tour compared to most merino wool socks. One thing that’s worth noting — all of the Dissent socks are pretty difficult to get on. However, if you turn half of the sock inside out so that you’re just putting on the lower “foot” portion of the sock, they’re much easier to put on (see 0:48 of this video for an example of this). 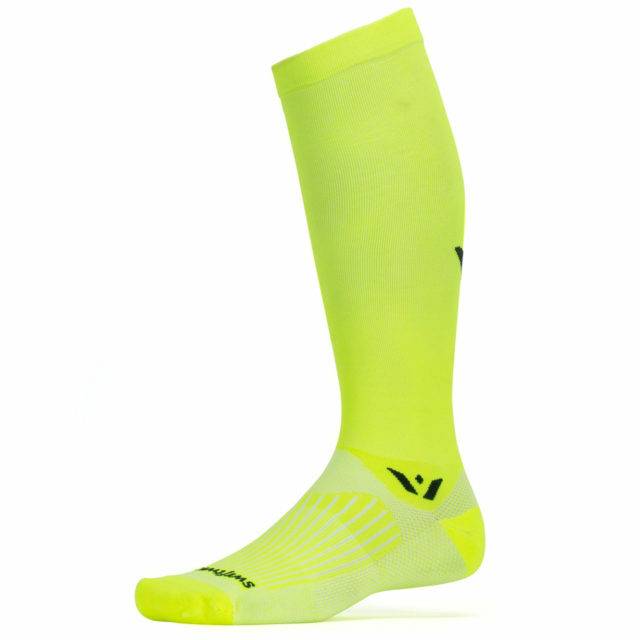 If you want a non-cushioned compression sock for your tighter boots and want one of the most secure fits out there, I highly recommend the Dissent Nano Tour. It’s an investment, but even after dozens of washes, these socks are still performing like new. Luke: These socks could almost go in the “Non-Cushioned” category, since the lower foot portion has almost no cushioning. But the Darn Tough OTC Light has just a bit of cushioning around the calf, which makes it a good option if you want a very low-volume fit in the lower portion of your boot, but appreciate just a touch of cushioning on your shins. In terms of fit, this sock pretty snug, though not nearly as tight as the compression options from Dissent and CEP, and just a bit looser than the options from FITS and Bridgedale. 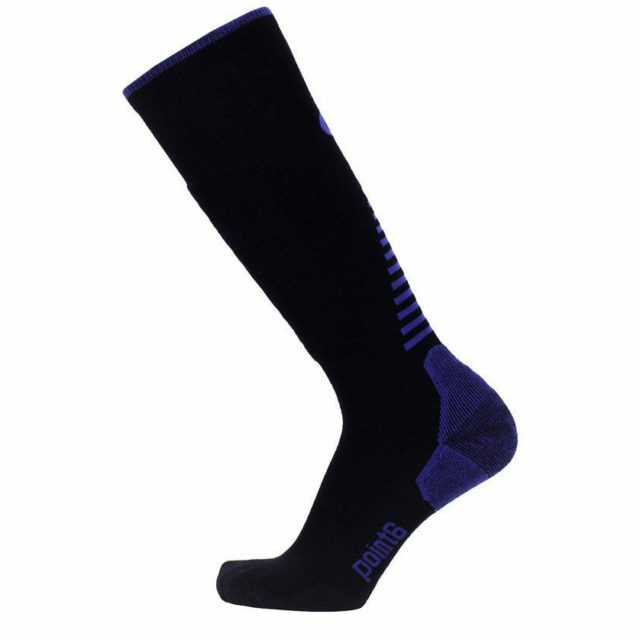 But the Darn Tough OTC Light is a very good, minimally cushioned merino wool sock that comes in at a pretty good price. Luke: You could think of the Bridgedale Ski Lightweight OTC as the opposite of the Darn Tough OTC Light in terms of cushioning — the Bridgedale Ski Lightweight OTC has a bit of cushioning around the toe, heel and foot, but has basically no padding around the calf or shin. That makes this sock worth a look for people who appreciate light cushioning around the foot, but who don’t need or want a sock with a bulky shin / calf (e.g., if you have big calves and find your boot cuffs to be too tight). In terms of fit, the Bridgedale Ski Lightweight OTC feels a bit more snug than the Darn Tough OTC Light, with a more uniformly tight fit around the toes and calf. However, the Bridgedale’s elastic isn’t quite as strong as the compression socks here (see the next sock), and I have noticed the Bridgedale moving around in my boots that are on the higher-volume side. 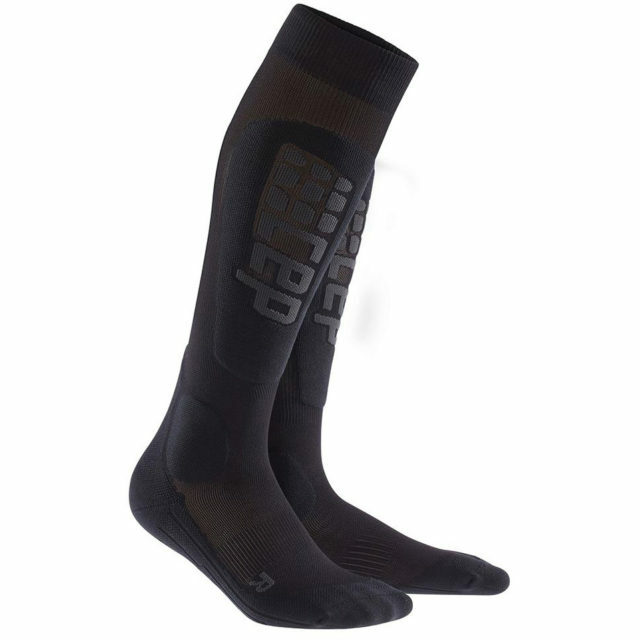 Luke: Like the Dissent socks, the CEP Ski Ultralight has an extremely snug and precise fit. However, the thing that sets these CEP socks apart is that, while they don’t feel sloppier than the Dissent socks, the CEP Ski Ultralight isn’t quite as tight. This makes it a great option for people who want the excellent fit of compression socks, but find Dissent’s socks to be a bit too tight for their taste. The CEP Ski Ultralight has a bit of padding around the toe, heel, and under the foot, as well as around the ankle bones and shin. For me, this is about the perfect amount of cushioning for most boots. Enough to provide a bit of plushness around high-impact areas, but without compromising a pretty low-volume fit. If you want a lightly cushioned compression sock but don’t want something that feels like it’s suffocating your foot, I highly recommend the CEP Ski Ultralight. 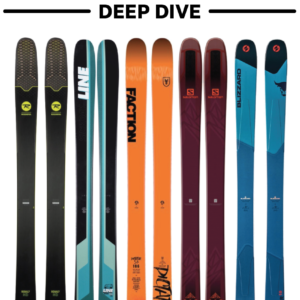 Luke: Like the Dissent Nano Tour, the Ski GFX Compression Hybrid Protect offers an amazingly snug fit and I’ve never had issues with it moving around inside my boot while skiing or skinning. The Hybrid Protect features light padding around most of the foot and the front of the shin, and its padding feels pretty similar overall to the CEP Ski Ultralight. The Dissent Ski GFX Compression Hybrid Protect has been my go-to sock for most days, particularly if I’m in a new boot. Its fit is phenomenal, and its level of cushioning works for most boots I use. If you want a slightly less tight, but still precise-fitting option, check out the previous sock. And if you want a nearly identical fit and level of cushioning but with the anti-odor benefits of wool, see the next sock. 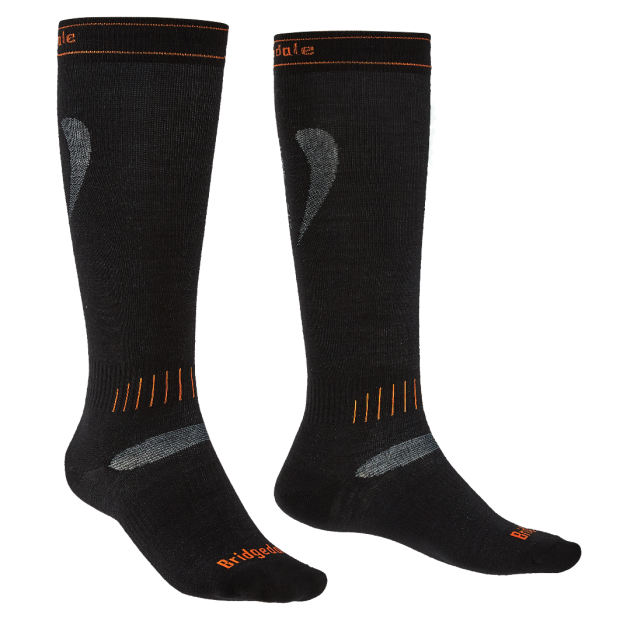 Luke: This sock offers basically all of the benefits of the previous sock, but uses a merino wool / synthetic blend that I’ve found to be a bit warmer and lasts longer without stinking too bad. 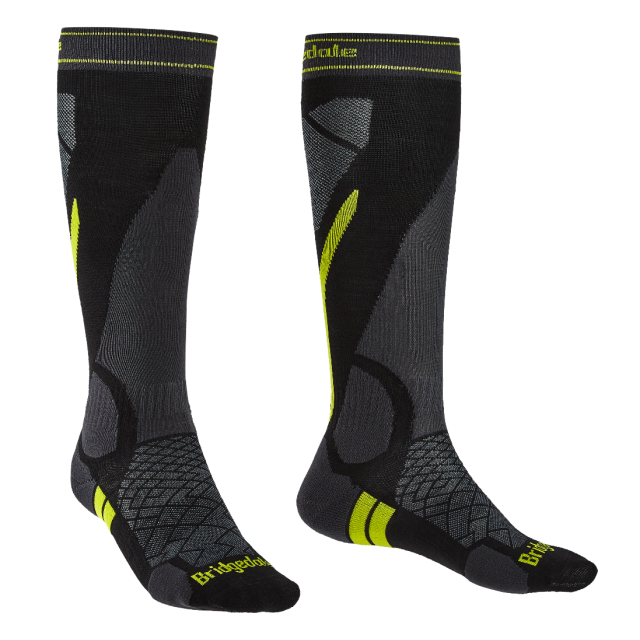 Like all Dissent socks, the GFX Hybrid DLX-Wool offers a super-tight fit and seems to help a bit when it comes to decreasing calf fatigue. 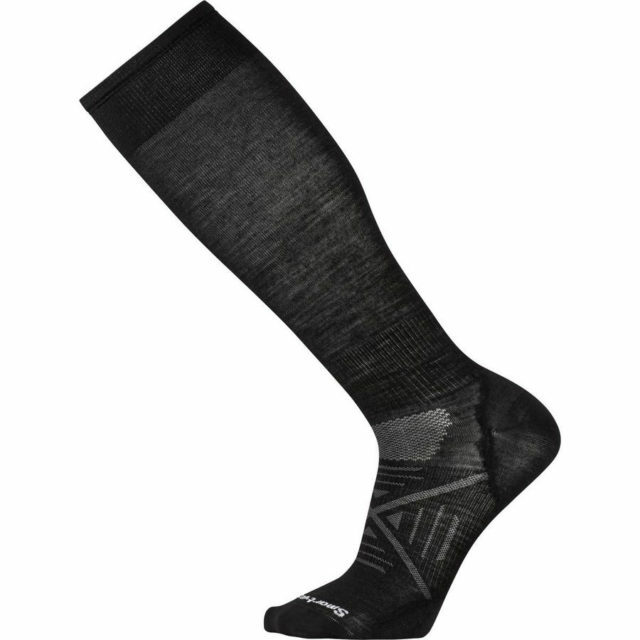 Luke: This sock features a unique combo of light cushioning around the heel, heavy cushioning on the shin, and no cushioning underfoot or around the toe. As a result, I think the Ski Pro Racer Light OTC makes the most sense for people who often need more room in their boots around the toe, but who still appreciate some padding on their heels and shins. The Ski Pro Racer Light OTC’s fit feels pretty similar to the Darn Tough socks — snug through the calf and ankle, but a bit looser than average around the toe. One note — those who are sensitive to wool should probably steer clear of this sock. It’s a bit itchier than other wool options like the next sock. But if you know you like wool ski socks and like the sound of the Point6 Ski Pro Racer Light OTC’s cushioning, it’s a pretty good all-round sock that comes in a bit cheaper than the other options here. Luke: This is my favorite non-compression sock. All the FITS socks I’ve used offer the most precise and snug fit compared to other non-compression socks. So if you’re deterred by the very tight fit or high price of compression socks but don’t want your socks moving around, I highly recommend FITS. The FITS Light Ski OTC features pretty substantial padding around the toe, heel, and shin, and it could almost be put in the “Midweight Cushioning” category. But the FITS Light Ski OTC features padding only in those targeted spots, with a thin, stretchy fabric used everywhere else, making it a bit less cushioned overall than the socks in the next section. This sock’s high wool content also makes it one of the best options here when it comes to fighting off odor — I’ve worn these for several days in a row without washing, and they still didn’t smell too bad. 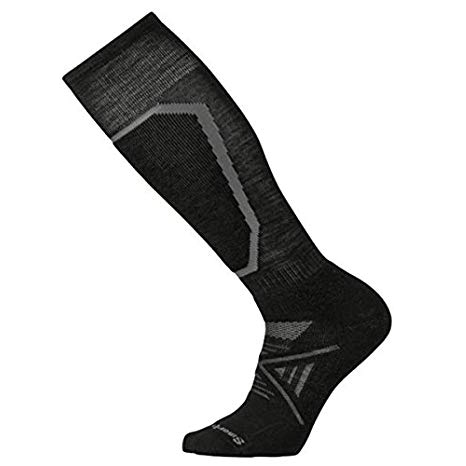 Luke: This sock takes the compression and excellent fit of the Dissent Ski GFX Compression Hybrid Protect and fills out the cushioning throughout the entire sock. But thanks to Dissent’s extra-tight fit, this sock doesn’t feel nearly as bulky as the Darn Tough and Point6 socks below. That makes it worth a look for people who want a moderately padded sock without the bulk and sloppy fit that sometimes come with more cushioned socks. 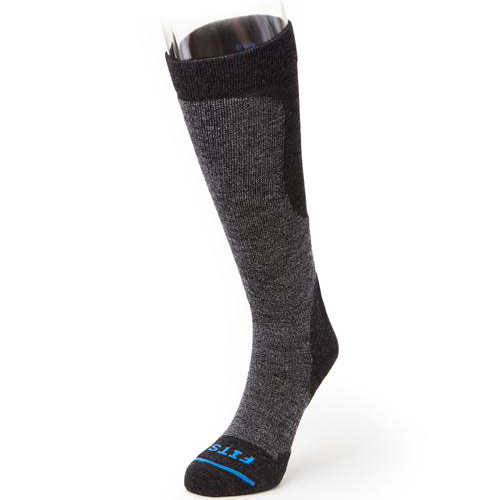 Luke: This is essentially a wool-blend version of the previous sock, making the decision easy: if you want a moderately cushioned compression sock and also want something that won’t smell as quickly, this is the sock for you. Luke: This is a great merino sock that rivals the FITS Light Ski OTC in terms of fit. The Smartwool PhD Ski Medium offers medium cushioning around the toe and heel, and then features a very thick, padded section on the shin. 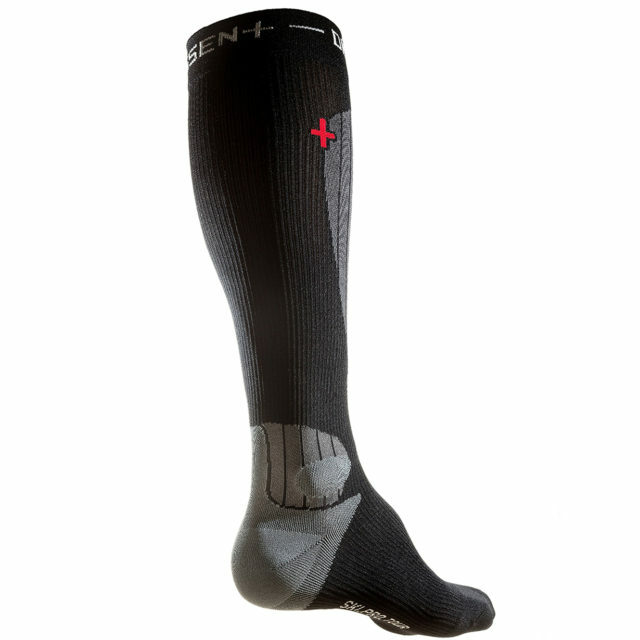 If you often experience shin pain in your boots, this sock is worth a look. My only real complaint with the Smartwool PhD Ski Medium is the top of its cuff — it can feel a bit restricting at the end of the day, like the pressure is only distributed over the last inch of material. 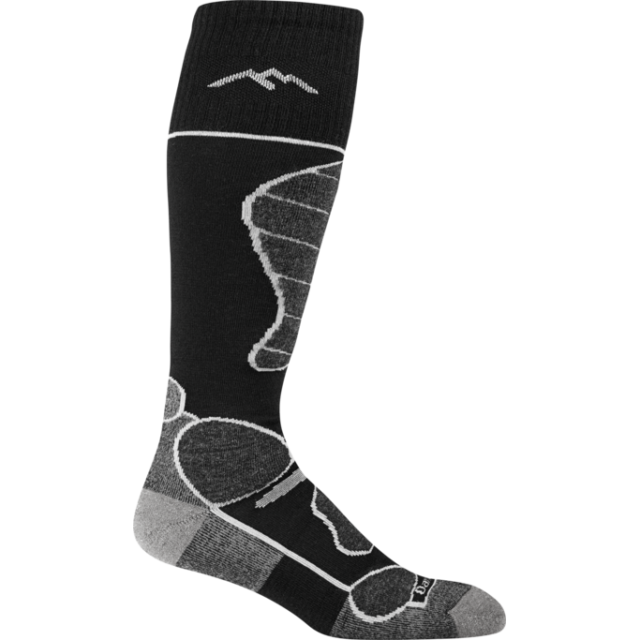 Luke: These socks were specifically designed to add padding where people most often need it: the toe, on top of the foot where the ski-boot buckles sit, under the entire foot, around the ankle bones, the heel, and along the shin. In those areas, the Function 5 has very plush, thick cushioning. But apart from those areas, this sock is actually pretty thin. So if you’ve experienced some discomfort in the specific areas mentioned above, or need to take up space there, the Darn Tough Function 5 OTC Padded Cushion might be worth a look. 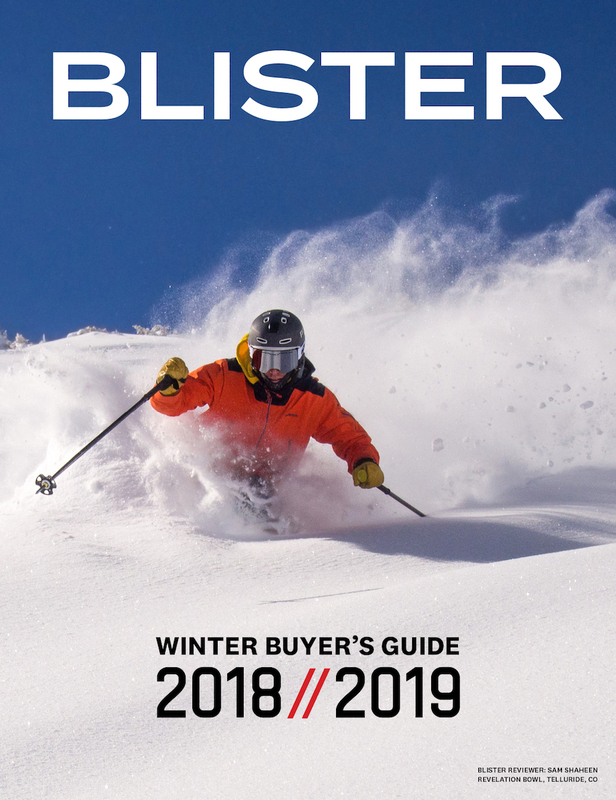 Luke: While the previous sock takes a very targeted approach to cushioning, the Point6 37.5 Ski Blend Medium OTC is more generous with its cushioning. Apart from the very top of the cuff, this whole sock is pretty thick. Its fit isn’t quite as snug as the options from Smartwool and FITS, but the 37.5 Ski Blend Medium OTC could be a good option for people who need to take up a bit of volume in their boots (e.g., if you have old, packed-out liners). Really missing here is the height of the socks. Sock makers seem to think everyone has the same length legs, so knowing which ones are taller or shorter can really help someone find the right sock. For me, with long legs, the Darn Tough are better than the Smartwool, but not near as good as the old Falke ones I have, at reach up high and staaying there. That’s a good point, but the tricky thing about measuring the height is the elastic nature of all these socks — some may measure short when not on your leg, but then stretch significantly once you put them on. Meanwhile, others don’t stretch much at all, so there’s a lot of variation in terms of measurements. That said, in general, I’ve found that the CEP, FITS, and Darn Tough socks tend to run on the taller side, with Dissent not too far behind. As always, the safest bet is to try some on, but I know that’s not always possible. I am not sure that the elastic matters much. Sure, you can pull any sock up super high by stretching it, but after a while(unless you are wearing garters), it will just creep back down again, so I think the “unstretched hight is quite useful. I do agreee that the heel/ankle area may stretch differently on some socks than on others, which might influence total height a bit, but since that’s only. Small amount of fabric, the absolute difference there can’t be very much.